Czech style pale lager known as Světlé Výčepní. The 10 plato strength (4% ABV) is the most popular in the Czech Republic, as opposed to the 12 plato strength (5% ABV) that is more familiar in the US. Brewed with European malts, Czech Saaz hops and soft water. Notch Pils pours a clear golden color in the glass with a frothy, white head on top. The foam dissolves slowly to a thin sheet on the glass leaving behind a fair amount of lines and spots of lace on the glass. Inside a flurry of bubbles flow to the surface. The aroma is faint with grassy hops and crisp toasted malt. There's a hint of lemon in there too. Each sip of this light to medium bodied beer is lightly creamy, soft and moderately carbonated. The flavor begins with grassy hops and notes of lemon citrus. Balancing out the hops is a taste of crisp toasted malt. It finishes sweet with a the grassy hops linger when gone. This is a very easy drinking tasty beer. Well balanced and with the lower abv you can enjoy several at one sitting. Another Notch brew thanks to Yamar 18. This pours a pale gold with a 1 finger head of foam and again for a Notch beer, some very good lacing. Aromas of spicy herbal hops are at the forefront. I get just a tad of a malt smell...bread? Maybe biscuit? Wow, another brew with some great balance. Yeah, it's biscuit for the malt profile, the hops are herbal alright, just a nice crisp spiciness that doesn't go over the top. Swishing the beer in my mouth to get the ultimate experience of what a brew has to offer, I'm amazed that THIS is what I get in a 4% abv brew made in the US. Nice lightish mouthfeel, the drinkability, at least for me, is through the roof. Yikes, I love this beer! On tap at Bit Bar in Salem, MA. This one pours a slightly dark straw yellow, with a small foamy head, and lots of lacing. This is slightly minerally, with a crisp floral aroma and bready malt. This is very simple, but very pleasant. There's a crisp mineral feel to it, with light grassy and floral hops, a very light sweetness, a solid doughy and bready malt backbone. This is light bodied, crisp and very nicely clean, with a very high level of drinkability. 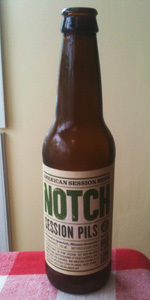 Notch continues to very much impress me with their mastery of session beers. A - served on tap at Legal Seafood at Logan Airport. Glass came with a substantial head that lingered for a good amount of time. Light lacing on the glass. The beer was blonde in color and fairly clear. S - very little detectable. What is there is nice. T - as someone else mentioned it didn't really taste pilsnery. Its good, in a sort of bland way. Seemed more like a light pale ale. M - body that I expected with pleasant carbonation. O - I don't see myself having this one again, but elements of this brew encourage me to try other offerings from Notch. Great low alcohol beer when you need that in your day. Appearance: Had this one at a work event, so I can't comment on how the beer actually looks. Nice looking can though. Smell: Standard 'beer' smell with hints of noble hop herbal and grassy notes. Taste: Light biscuity malt flavors with a subtle touch of grassy hops. Somewhat bitter finish. Mouthfeel: Light body with high carbonation; very drinkable. Overall: A drinkable, quaffable beer for sure, and definitely sessionable at only 4%, but one that is lacking quite substantially in the flavor and aroma department. I'd reach for a Summerfest in a heartbeat if I wanted a Czech pils.